Home / All FAQ / Account FAQ / Can I use a Credit Card to buy MEAP? Yes. Using Stripe or PayPal, both accept Credit Card Payments. 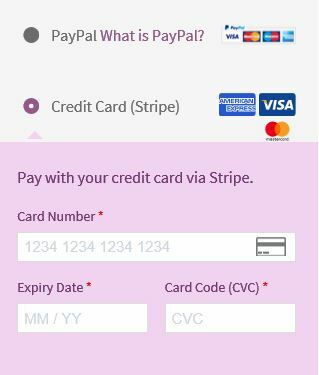 If you are having trouble with PayPal / Stripe and wish to pay by some other method please drop us a line and we will try to help. Use the Contact Form and supply as much info as possible. Using Stripe to pay with your credit card. Just select the Credit Card option. Fill in the form. Complete your purchase. Using PayPal to pay with your credit card or bank account. When you reach the checkout, look out for the credit card symbols (see example below) then simply click the ‘continue’ link and you will be able to complete your purchase using your credit card or bank account. This is just an example picture, so the link won’t work. It will work when you reach the PayPal checkout page! If you have used PayPal eCheque payment it usually takes about 5-7 days for the eCheque to clear. After that period you will receive activation automatically as normal. This is not my rules – This is the way PayPal works with eCheques. Previous post: Does MEAP do OMF? Next post: Do I have to use PayPal to buy MEAP?